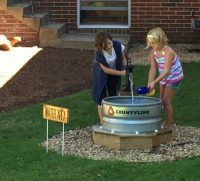 Holden Christian Academy is thrilled to add a Nature Explore Courtyard to our school. 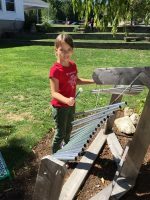 It beautifully enhances our options for learning and playing outside. We believe that God has created an incredibly intricate and fascinating creation that can evoke wonder, awe, deep learning, and most importantly a connection to the Creator. Romans 1:20 says it well “Forever since the world was created, people have seen the earth and sky. Through everything God made, they can clearly see his invisible qualities—his eternal power and divine nature. So they have no excuse for not knowing God. NLT” We want to give our students opportunities to experience nature by being immersed in it. We want them to use their bodies and all their senses to examine, enjoy, and appreciate nature as it reflects our Creator. This courtyard has been lovingly designed, constructed, and equipped for the purpose of giving children (and adults!) 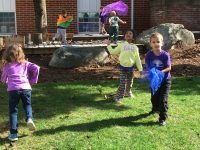 a safe place where they can enter into fun, self-directed activities, play, and reflection. It is aesthetically pleasing, yet deceptively rich in learning opportunities! We are appreciative of the help, planning, workshops and research-based ideas provided by Nature Explore and are thrilled to become a certified Nature Explore site in Massachusetts. Today, as one enters through the new arbor, gate, and white picket fence, the space looks rather serene and quite spacious. Then the school doors open and children come pouring out. Some run up and down the hill with their friends, making large circuits around the entire space. 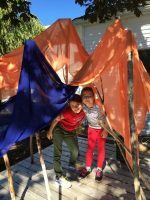 Others are itching to build a fort and cover it with brightly colored fabric. Still others pick vegetables and herbs from the garden and compare the scents and textures of the leaves. 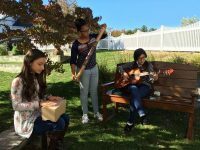 The water area, equipped with an old fashioned pump, is always a favorite space, as is the music area where today some alumnae are visiting and jamming. Our alumnae not only come back to visit and help maintain the space they helped to construct it. They enter right into the action with the kindergartners. 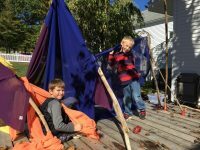 The older students were enlisted by the younger ones to help build a fort, observe a chipmunk house, chat about when they were in kindergarten, and cut up herbs. This all happened naturally and joyously in a space conducive to connecting, both with nature and one another. We call our space the Nature Explore Courtyard because it’s in the courtyard which is in the heart of a busy church and school. The space is highly visible to all who enter the main door of the church and is directly accessible to all through both the school and church doors. Because of its convenient location, teachers may use the area frequently for all kinds of lessons. 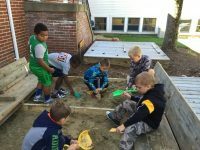 Recently, several grades made use of the sandbox for an introductory lesson on the differences between geology, paleontology and archaeology. Prior to the lesson, interesting rocks, fossils and artifacts were randomly buried in the sand. The students were then able to find them, brush them off, and decide if what they found would be best examined by a geologist, paleontologist or archaeologist. It was quick, simple and a big hit because the children were actively involved. Because we want this space to be used by all our student PK-8th grade, a community playgroup of toddlers, and the church as well, we’ve added a few areas that we hope will meet a broader spectrum of needs. We have two new spaces for quiet, reflective time and for reading. We have designated a shady, grassy area as a reading spot. It is at the top of the space, against the fence, and a bit away from the more active, noisy areas. 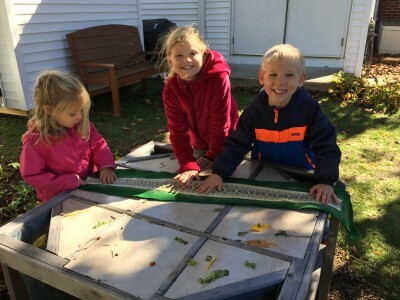 We hope to help our students do more reading and journaling outside in the fresh air. The second area is called, ”Be Still and Know That I am God”. Our prayer is that it will be a quiet, reflective area with a water feature for white noise and tall grasses and plantings for a little privacy. We may install a bench if needed. There, anyone so inclined can separate themselves from others to think, reflect and pray. We hope to create a lovely, natural space where people of all ages can connect with the living God. We are very thankful for this space and want to thank the Holden Chapel family for their continued encouragement and willingness to provide the space required as well as the loving encouragement to see this project through. We also thank the students, staff and parents of HCA who have provided countless hours and brawn for building and maintaining this area. We owe a great debt of thanks to the Cleveland Foundation for a grant that made this possible. Lastly, we want to thank our preschool teacher, her family, and in particular, her father for their amazingly creative gifts which they have lavished on us in every way!